We ladies find it adorable when a guy cooks for us. But we find it even more irresistible when the man prepping the meal is also a feast to look at. Cosmo.ph got to chat with food blogger and Esquire Philippines food and drinks editor Erwan Heussaff--who also happens to be Solenn Heussaff's sibling and Anne Curtis's beau--at the launch of the campaign Make It Happen, Make It Makati's newest project. In "Make It Indulging: Makati Food & Pub Crawl", Erwan gives a tour of the top hangout places and restaurants in Makati. If you've visited his food blog, The Fat Kid Inside, then you're probably familiar with his recipe posts and video entries, which are, by the way, all original. 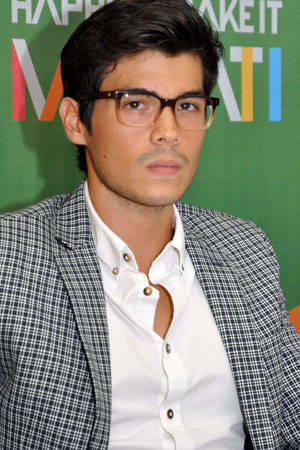 Here's something even more surprising about this kitchen hunk: Erwan never went to culinary school! Like a true food connoisseur, Erwan shared his favorite hotspots in Metro Manila, his secrets to keeping his fit figure, the best places to go on dates, and why he loves cooking for his girlfriend, Anne. Aww. How do you stay in such shape despite being a foodie? Well, I recently started with triathlon. I work out at six in the morning for about two hours before going to work, and then when it’s the season when I come home at night, then I also work out. So about two workouts a day after eight hours of work. Even at work I burn calories, so I can eat basically anything I want and I’ll be okay. What are the top three restaurants you love here in Manila? I featured some of it [in this project]; XO46 [in Salcedo Village] goes to my top. I really like the vibe in Massetto Wine Bar [in Salcedo Village]. And after a long night out or a long day at work, brunch at Apartment 1B [in One Lafayette Square] for me. What dish do you like from those restaurants you’ve mentioned? Eggs Benedict. And I’m a huge sucker for pancakes and waffles with lots of maple syrup. What do you think are the best places to take your girl out on a date? For drinks, I really love the Blind Pig because it’s quiet; they don’t allow lighting, it's candlelit. Their cocktails are really good. You go here if you really want to spend some time with someone and not be bothered by anyone else. It’s one of the best places. M Café after work or Murphy’s in Legaspi Village if you’re the type of girl who likes quiz nights. Where do you usually take your girlfriend, Anne, on dates? A lot of places actually. But I cook a lot, and I try as much as possible that breakfast, lunch, and dinner, I cook them myself. I think it’s really sweet and thoughtful when you cook for someone you love. Anne is really simple; roast chicken, anything roasted in the oven is okay for her. I’m very French in my selection; she’s very English and Australian in her selection. She likes the simple food, I like the more complicated ones.